Newport Beach Restaurants, Orange County Dining Choices and Specialty Cuisine. Click here check our availability calendar. If no availability online then please call the hotel directly. Newport Beach Restaurants: One of the exciting things about Newport Beach is the multitude of dining choices available to you, our NEWPORT CHANNEL INN Guest, with well over 400 restaurants located right here in Newport Beach. From the freshest seafood, prime meats and organic produce to exotic delicacies from far off lands, you're sure to find a restaurant to satisfy any taste or budget. Our front desk will be happy to offer suggestions and make reservations for you. Restaurant menus are on hand for you to review and help make your selection a little easier. NEWPORT CHANNEL INN Guests also receive V.I.P. 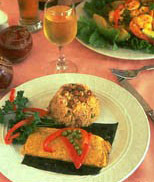 treatment at a number of restaurants, including preferred seating and complimentary appetizers or desserts. Newport Beach offers waterfront dining at its best! Enjoy sweeping, stunning views of Newport Harbor and dine on succulent crab, lobster and the freshest fish, skillfully prepared and graciously served amid candlelight surroundings at such fine restaurants as the Rusty Pelican, Harborside, Newport Landing, The Cannery, Billy's at the Beach and Bluewater Grill. 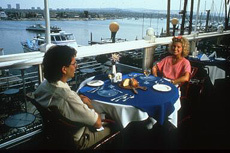 There are dozens of other bay or ocean view restaurants providing both moderately priced dining and gourmet cuisine from around the world. A Hornblower Yacht cruise is the ultimate way to experience Newport Harbor, with both a weekend dinner dance cruise and a Sunday brunch cruise offered. Check with the NEWPORT CHANNEL INN's front desk for information on the cruises. If you are looking for that very special romantic restaurant, where food, staff, and ambiance are all carefully orchestrated to create a memorable dining experience, you might try the NEWPORT CHANNEL INN Staff's personal favorite, the Five Crowns, a faithfully reproduced English country inn which serves award-winning favorites such as roast prime rib of beef in thoroughly charming surroundings. Perhaps you may prefer the award-winning Winery Restaurant with its outstanding wine list, or the sumptuous atmosphere of Fleming’s Prime Steaks, or the Pacific Rim offerings of Roy’s or a catered Gondola Cruise around the canals of Newport Harbor. what a view!!! 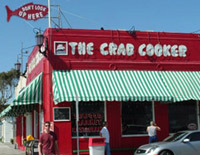 Casual dining at the famous Crab Cooker has been a treat for over sixty years. B.J. 's Pizza, voted "Best Pizza" in Orange County, will make you wish you had one in your town. The Yardhouse is a must for beer lovers with over 180 beer taps. NEWPORT CHANNEL INN Guests enjoy savings at many local restaurants with coupons available at the front desk. The NEWPORT CHANNEL INN has some good dining choices right next door. Cappy's Café opens daily at 6 a.m., and is so popular, you may have to wait in line on the weekends for brunch. The Spaghetti Bender, Newport Beach's favorite neighborhood Italian eatery, serves huge portions at reasonable prices. Hidden just behind is a special gem of a restaurant, Eat Chow, with fresh California offerings open all day. Just a few more yards up the sidewalk is the Big Belly Deli where you will find tasty deli sandwiches and gourmet pizza for both dine-in and take-out. A bit further up the sidewalk is chef-owned Alyssa Italian Restaurant which has been receiving rave reviews. Fujiyama Sushi, Chronic Taco, and Jack-in-the-Box are one stoplight south. If you really can't decide, be sure to stay at the NEWPORT CHANNEL INN in the fall and try the best at the Newport Beach Wine and Food Festival. See our Special Events Page for more details! We try to answer our E-mails within 24 - 72 hours. Be sure to include the dates you are interested in and the number of people in your group.